Abstract: Airwheel has just pulled the covers off their latest smart product — the SE3 electric suitcase and it looks pretty awesome. Rather than pulling your luggage from terminal to terminal, travelers can sit on the SE3 and reach to destination effortlessly thanks to an electric motor. 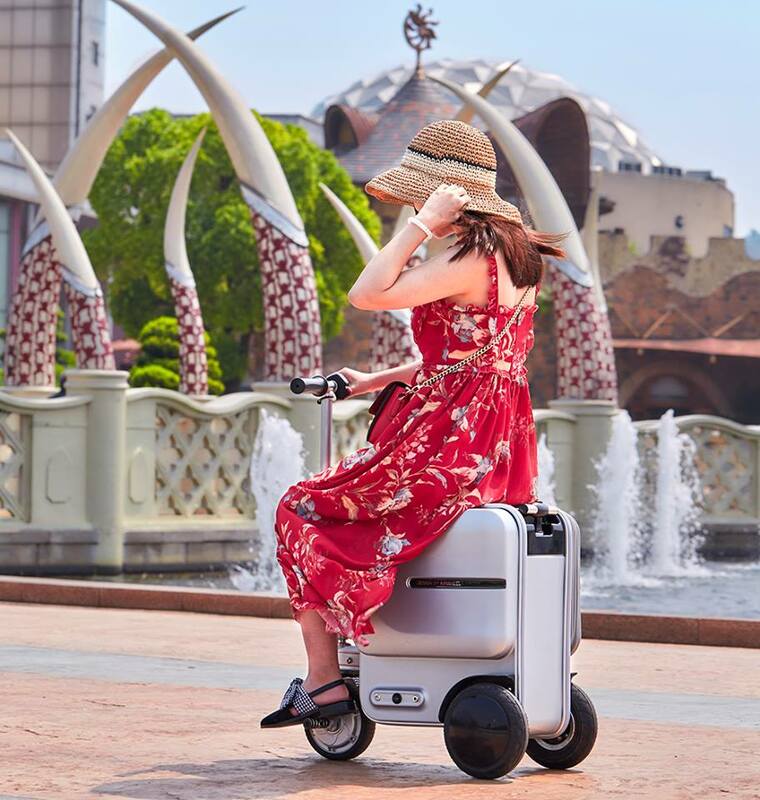 As a leading smart travel solution provider, Airwheel is always committed to bringing the original fun of cutting-edge science and technology as well as fulfilling its corporate culture “free intelligent life.” Airwheel has just pulled the covers off their latest smart product SE3 fully functional drag-along suitcase allowing users to ride it from terminal to terminal rather than pulling your luggage. Ideas generated at work after a travel were more diverse than before going on vacation, showing more ingenuity by avoiding a reliance on conventional ideas and routine solutions. Airwheel SE3 makes the travel easier and smarter. Airwheel team has spent a long time developing this rideable suitcase. SE3 motorized ridable luggage has a small motor, lithium ion battery and telescoping handlebars with a throttle and brake. Riders control the suitcase with a throttle and handbrake. Equiped with three large wheels with special treads and excellent grip performance making it possible to overcome various road conditions while riding. So, if you feel tired, you can ride it anywhere. What's more, SE3 ridable carry-on luggage has a adjustable handle made of ultra-quiet aircraft-grade aluminum alloy rod which increases the strength and reduces shake. The gear adjustment design adapts to different heights. There is an automatic retractable design to save space to the maximum. The one-button to auto-expand make it smaller in no time and users can change freely riding and dragging. It is a lot easier to travel today than it was just a few years prior. Having the right travel gadget on hand can really improve any trip, such as the Airwheel SE3 ride on luggage for adults. Next time, you will no longer trudge through an airport dragging a suitcase, because you can pull handlebars out of SE3, sit on it and zoom to your gate. Wish you a pleasant journey. Next：What kind of advantage does Airwheel H3S automatic visual following wheelchair offer?